Finally, men have a tea they can turn to to help them get the most out of their bodies and minds. 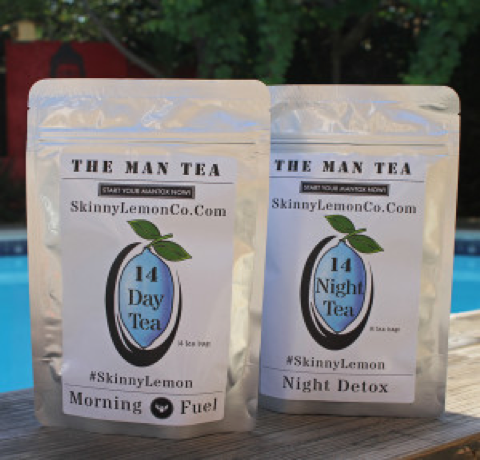 Enter Man Tea, a new set of two teas, recently launched by Skinny Lemon Company just for men. The unique blends function to perfection to increase immunity and strengthen. With a Step 1 Morning Fuel Tea Blend, that enhances energy, curbs appetite, boosts metabolism and prepares a man’s body for an amazing body day; and a Step 2 Night Detox, a blend crafted to relax the mind and body, and detox away unwanted sludge and toxins during sleep, Man Tea offers men a great set of natural tools to help get the most out of life. Early users couldn’t be more pleased. “We know that our Morning Fuel and Night Detox offer a wonderful combination, that when used together can be a real game changer for men. There’s really nothing like Man Tea on the market today, and we’re happy to be helping change the way men think about tea.” said company founder Amber Blumer. The Man Tea Blends are made in small batches and each bag contains 14 Morning Fuel and 14 Night Detox tea bags. Feedback has been very positive. 14 NIGHT DETOX Tea bags. Step 1, THE MORNING FUEL is enjoyed upon awakening to create energy, curb your appetite, metabolism and prepare your amazing body for the day. Step 2, The NIGHT DETOX tea is sipped on to relax your mind and body, and detox away unwanted sludge and toxins while you sleep. The Man Tea blends are formulated to work together in harmony and help you look and feel like a warrior in your body! Combine this program with real exercise, water, and clean foods and your results will show. THE MORNING FUEL tea gives you increased metabolism, which assists in weight management so you can seize the day! THE MORNING FUEL tea assists the male body in correctly processing food, so it creates energy instead of fat. THE MORNING FUEL is the perfect tea blend for men who are working towards a muscular, cut physique along with incredible energy and vitality. THE MORNING FUEL is the perfect addition to any current workout regime, because it does not interfere with workout powders or exercise supplements. THE NIGHT DETOX tea relaxes your mind and mood as you unwind from the day. THE NIGHT DETOX works on flushing out toxins while you sleep. This tea uses a specialty formula of herbs that increase energy expenditure and fat oxidation, which results in weight shredding and helps maintain a healthy body weight once goals are achieved. It cleans your digestive system and aids in liver function. It also increases your metabolism, which accelerates the fat burning process.